Allan Frumkin Gallery, Chicago (no. 1617). Anonymous sale, Sotheby's, London, 3 April 1974, lot 197. Acquired at the above sale by the previous owner, and thence by descent. The present work is being sold with a photo-certificate from Germana Matta Ferrari. A heathen ritual in an alien landscape: strange humanoid creatures are raising their arms in unison as though celebrating the dance-like antics of the two figures in the foreground, each of which is dressed elaborately and each of which appears to have more arms than the norm... Las Majas, Carmen, executed circa 1939-42, is a haunting vision from Matta that appears to scrape beneath the comfortable surface of the world that we view, instead showing dark life forces. There is an operatic quality to this scene, with the followers in the background, while two lead characters dominate the scene, that is wholly apt considering its links to Carmen. For when he was in New York, Matta-- who was intrigued and obsessed by the intense tragedy of the central eponymous character in that opera-- set about creating several works on the theme. This was a prelude to an intended ballet adaptation of Carmen that was to be arranged by Pavel Tchelitchew, who contributed greatly both to Surreal painting and the field of ballet during his life. Discussing his move to America during the period in which Las Majas, Carmen was executed, Matta explained: 'When I arrived in the United States, I started talking about the earth. In these pictures I tried to show, not landscape which is 'scenery'-- a scene of the earth-- but the earth as something terrific, burning, changing, transforming, growing' (Matta, quoted in O. Berggruen, 'The Architecture of Desire,' translated by A. Cremin, exh. cat., Matta 1936-1944: Début d'un nouveau monde, Paris, 2004, p. 17). It is this that he conjures in Las Majas, Carmen, with its sculpted mountain-side, reminiscent of Petra, and the hollowed caves revealing depths beyond the imagination, carved arches stretching into the distance, strange phallic mushroom-like pseudo-stalagmites thrusting out of the façade; an altar-like arrangement in one of the arches has placed a strange amorphous form in the place of honour, while an unnatural, green, crystalline tree dominates the arena in which this strange ceremony is taking place. 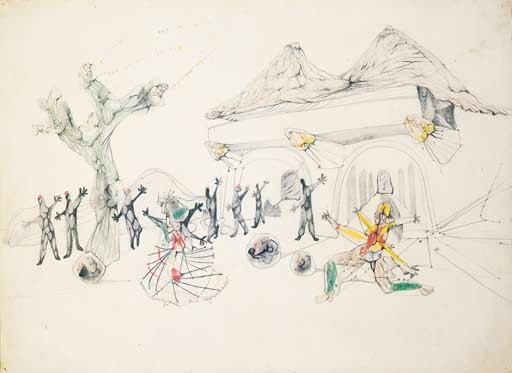 It was in his drawings that Matta first explored the lure of art, forsaking his original training as an architect, and it was the early drawings of the late 1930s that brought him to the attention of the Surrealists. Like his later oils, his drawings often introduce an impossible, semi-organic world that blends a fascination with the subconscious with science fiction and with horror. The webbed forms that appear to comprise the foremost figures smack of anatomy, as though the bodily organs are either visible through the skin or are indeed exposed to the elements. Matta tapped into this netherworld of disturbing visions partly through the use of his sponge-like absorption of cultural references-- both high and popular-- and through automatism. It is this, the spontaneous energy of creation, that lends the forms their strange jutting and organic appearance. It was also this aspect of Matta's drawings that would later come to influence a generation of American artists who would explore the process of automatism under his auspices-- artists including Motherwell, Rothko, Gorky and Pollock.